Our cloth holder has cylindrical appearance, smooth and round line, anti-scratch protects family safety. Stylish appearance combines with sleek lines and practical functions, blending easily into contemporary household fixture. Our towel hook offers a utility storage for hanging towels, garments, hats, handbags, umbrellas, scarves, or others. Good helpmate for home organization, increases space utilization and improves quality of life. Warm Prompt: due to manual measurement, please allow a little size error. BEAUTY & SAFETY: cylindrical appearance, smooth and round line, anti-scratch protects family safety. Stylish appearance combines with sleek lines and practical functions, blending easily into contemporary household decor. NON-FALLING DESIGN: base can fixed more firmly, larger round hook designs to hanging securely without falling to the floor. Shows you a neat and easeful family. Overall size: L 1-13/16" x D 2-1/8"x H 1-13/16"(45mm x 54mm x 45mm). GUARANTEED QUALITY: solid premium-grade SUS 304 stainless steel, brushed nickel surface, protect against corrosion & rust. Withstands daily friction effectively and last basically using for long time. Net weight: 0.21 lb (93g). SPACE SAVING: offers a utility storage for hanging towels, garments, hats, handbags, umbrellas, scarves or others. Good helpmate for your home organization, increases space utilization and improves quality of life. 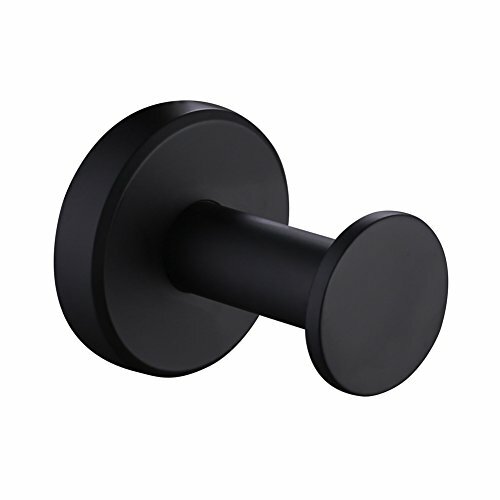 EASY USING: package includes mounting hardware, install to the wall or cabinet quickly. Bottom base can hide the used hole traces, keeps mounted place beautifully and works fantastically. If you have any questions about this product by Aomasi, contact us by completing and submitting the form below. If you are looking for a specif part number, please include it with your message.